Click on any picture to go straight to the blog it came from. I hope I haven’t missed any entries but if I have do please let me know using the contact form. Great round-up – so many delicious-looking dishes. Sadly I seem to have developed an intolerance to mushrooms recently and I really miss them! I’ll just have to enjoy these dishes in my mind! Look forward to hearing what is ‘in the bag’ next month. Looks like a fantastic group of recipes and a great response. 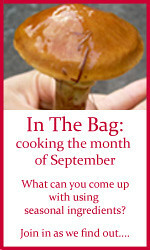 I’m sending you an email with my ideas for the next exciting In The Bag event. wonderful round up and lot of ideas with mushrooms. Loved this one! Thanks for hosting 🙂 Everyone’s dishes look great. I really enjoyed this event – I love all these ingredients. Can’t wait for the next one. Love this. Love mushrooms. Will be making a big pot of mushroom soup soon. Just made black bean (stop by and have a look)–it IS soup weather! This looks really lovely – haven’t come across an idea like this for bloggers before. The recipes are great. Can you let me know how it works, ie how bloggers can get involved? Do you invite people to join in?